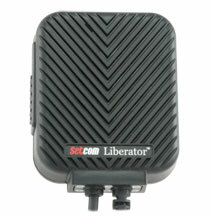 The most recent advance in police motorcycle communications, Setcom's Liberator Wireless system eliminates the cable between the officer and the motorcycle, providing maximum flexibility, freedom of movement and reliable communications. 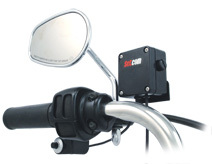 Rugged Enclosure - Newly redesigned waterproof enclosure is ready for the elements and rigors of motorcycle policing. No pairing - The Liberator automatically establishes a wireless link when an officer presses the push-to-talk button on the motorcycle. There is no need to "sync" or "pair" the system to the motorcycle. No batteries - The Liberator's efficient power management technology eliminates the need to recharge batteries, a potentially critical point of failure. It draws the minimal power it requires from the portable radio battery. Water-proof - SuperMic is IP-X7 and handlebar Transmitter is IP-X8. Conformal coated - The SuperMic and transmitter PC boards are conformal coated for additional water and contaminant protection. Up to 1,024 simultaneous riders - With its selectable channel plan, the Liberator has been carefully designed and rigorously tested to eliminate extraneous communication between two police motorcycles and/or between the Liberator and the portable or mobile radio. Up to 1,024 motorcycles can ride together without interference. Backward compatible helmet kits - Setcom's Liberator is completely compatible with Setcom's traditional Helmet Kits, making it easy and affordable to upgrade. Quick release jack - As with Setcom's traditional SuperMics, the Liberator's helmet connection provides a quick-release jack to improve officer safety. Worldwide Compatibility - Systems available for North America and Europe/ROW frequency plans.